A power tool is a tool that is actuated by an additional power source and mechanism other than the solely manual labor used with hand tools. The most common types of power tools use electric motors, pneumatics, or hydraulics. Horizontal, vertical, and angle grinders with wheels more than two inches in diameter. Disc sanders with discs greater than two inches and belt sanders. Reciprocating saws, scroll saws, and jig saws with blade shanks greater than 1/4 inch wide. These tools also may be equipped with a “lock-on “control, if it allows the worker to also shut off the control in a single motion using the same finger or fingers. Disc sanders with discs 2 inches or less in diameter. Grinders with wheels 2 inches or less in diameter. Platen sanders, routers, planers, and shears. Scroll saws, jigsaws, and saber and scroll saws with blade shanks a nominal 1/4 inch or less in diameter. 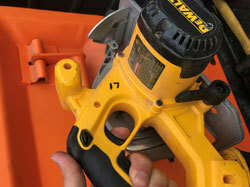 Other hand-held power tools such as circular saws having a blade diameter greater than 2 inches, chain saws, and tools with no means of holding accessories securely must be equipped with a constant pressure switch.